Dividing Ornamental Grasses - How To Create New Plants For Free! Dividing ornamental grasses in the early spring is a great way to add additional plants to your landscape without spending a dime. Even better, it helps to keep plants healthy, strong and vibrant! Ornamental grasses are a great way to add texture and year round interest to the landscape. Especially when dividing a few existing plants to create enough plants to fill an entire bed. And the process couldn’t be more simple. All it takes is a little knowledge of their growing cycle, and picking the right time to dig and divide. Ornamental grasses have a unique growing style all to themselves. As plants mature, new growth occurs only at the outer edges of the plant, and not from the original center. Although the plant continues to grow larger in circumference each year, the plant’s original center begins to die. If you look closely, you can see where this dormant’s grass center has already begun to die. Over time, this unique growth cycle leads to grasses that look a bit wild and unsightly in the landscape. But digging up and dividing ornamental grasses every few years can keep plants healthy and looking great. And, in the process, create a whole slew of new plants! Late winter or early spring is the ideal time for dividing ornamental grasses. As soon as the soil is warm enough to work, they can be safely split. To ensure success, dig and divide plants while they are dormant or before they go beyond their first stages of spring growth. Ornamental grasses should be divided early in the year before the plant develops too much growth. This allows plants plenty of time for plants to become established before the heat of summer. If you have not cut back your grasses, begin by cutting back any top growth to 2 to 3 inches above the soil line. Begin by cutting grasses back to make transplanting easier. Although shears will usually work, it may be easier to use hedge trimmers or even a chainsaw for older and larger grasses. Dig up the entire ball of grass, working the shovel around the edges of the plant’s root ball to lift it out. For older and larger plants, you may need to dig out the root ball in sections. Dig around the edges to remove the entire grass clump. If the clump is too large, remove in sections. Don’t worry if you slice the roots, you will be doing this anyway when you divide. Ornamental grasses are extremely tolerant of this process, especially when they are dormant. It is easiest to flip the plant over and divide from the back side of the root ball. A sharp shovel or an axe will work best to slice off new plant sections from the root ball. Working around the outer edges of the plant, slice off sections to create new plants. Sections at least 3″ in diameter will yield good first-year results. The new divisions created from a single, 12″ round plant. Smaller plants will take a few years to mature, while larger sections may become overgrown too quickly in the landscape. Be sure to only select the outer edge area of the original root ball for new transplants, avoiding the old center growth area. This “dead” portion of the plant can be split up and added to the compost pile. 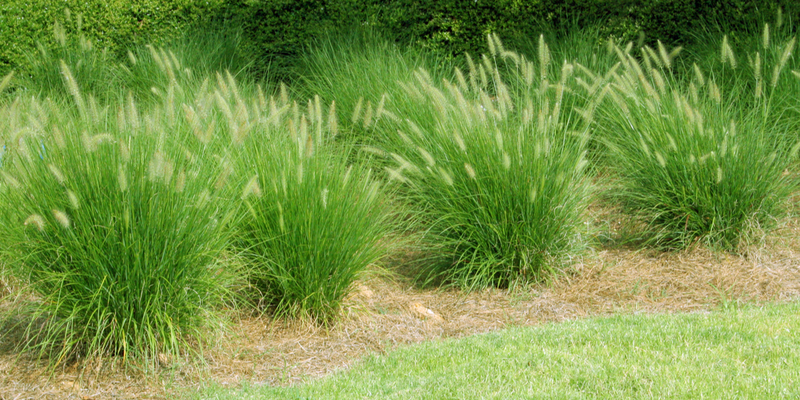 One of the easiest parts of dividing ornamental grass is the planting process. Simply dig a hole twice the size of the transplant. Mix in a bit of compost to the planting hole, water, and cover so that the plant’s crown is slightly below the soil line. A young transplant of blood grass takes off in early summer. As soon as the temperatures begin to warm in late spring, new growth will begin to shoot up from the crown. Before you know it, you will have a landscape full of free plants. When it comes to dividing ornamental grasses, it really is that easy!